It was a day so terrible, it will forever be known as Black Monday. 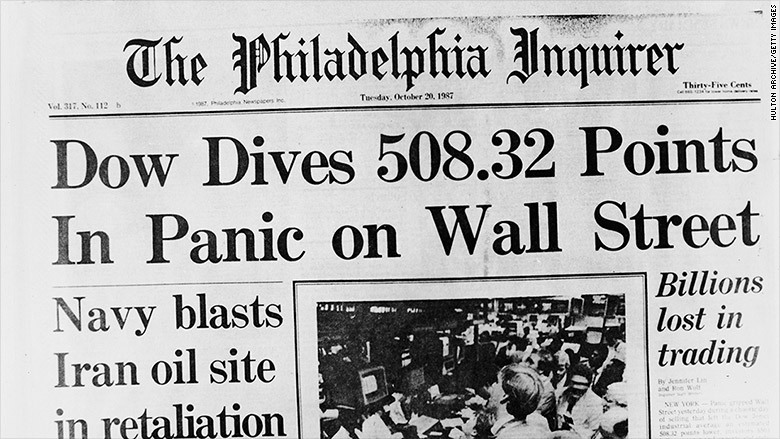 On October 19, 1987, the stock market collapsed. The Dow plunged an astonishing 22.6%, the biggest one-day percentage loss in history. Even bigger than the 1929 stock market crash, just before the Great Depression. Nothing since Black Monday has come close. Not the selloff after the September 11 terror attacks or the 2008 financial crisis. On that day in 1987, as the cameras rolled on the frenzied floor of the New York Stock Exchange, prices on the ticker tumbled, the panic spread, and the crash worsened. By the closing bell, the Dow stood at 1,738.74, down 508 points. A crash like that today would equal more than 5,000 points on the Dow. Related: Romans Numeral: Is it too late to buy stocks? The Philadelphia Inquirer after Black Monday in 1987. What was to blame? Heightened hostilities in the Persian Gulf, fear of higher interest rates, a five-year bull market without a significant correction, and computerized trading that accelerated the selling and fed the frenzy among the human traders. It was panic, and that's what separates a crash from just a really bad day on Wall Street. When emotion takes over and trading is no longer calm or orderly, that's when Black Mondays are born. Could it happen again? A panic is always theoretically possible. But a 22% Dow drop? Less likely. At least not in one day. After the Black Monday free fall, the New York Stock Exchange installed what are known as circuit breakers, designed to stop trading when stocks dive too far too fast. It's a forced timeout to give investors a chance to calm down and interrupt a panic. Today, if stocks dived even 7%, trading would be suspended for 15 minutes. A decline of 20% would shut down trading for the rest of the day. After the 1987 crash, the selling ricocheted around the world. But out of the ashes of Black Monday came the green shoots of what would be the longest and strongest bull market in American history. Now, 30 years later, the Dow is charging through milestones at a blistering pace. Just this year, the Dow has cracked 20,000, 21,000, 22,000 and 23,000, and the rally since 2009 is the second longest and strongest on record.